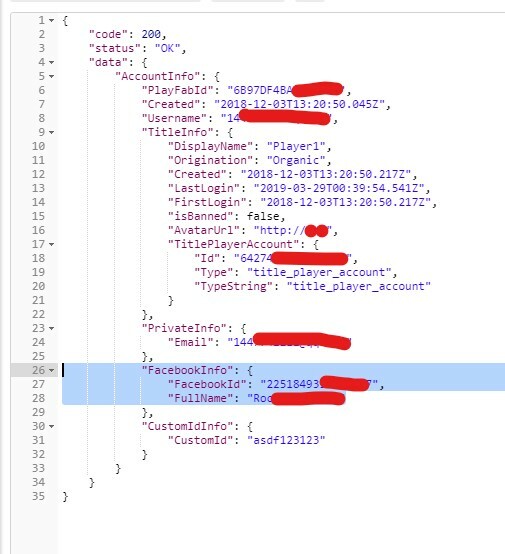 We have a player in the users who is linked to facebook but the identity doesn't show up in the playfab player account panel, any idea why ? Thank for your feedback, we will file this bug and report to our team. For now, you can retrieve detail of Facebook link information from API GetAccountInfo instead of it. Its actually all the players who are missing the link showing up, it was there before the outage on the 27th and hasn't come back. We knew you could get them with the api, its just a bit of a pain having to do that everytime someone has an account issue and I cant tell in the playfab panel if they are linked or not. Can you send us the specific Title ID and PlayFab ID? I just unlinked Facebook from my player account in our Unicorn Battle demo title, then re-linked, and the Facebook links shows up on my account, no problem. It looks like this was fixed and deployed Friday evening.